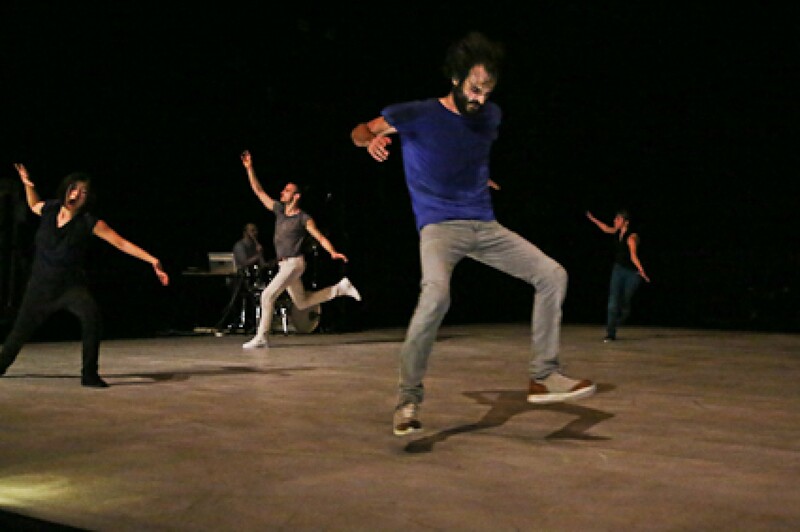 Five dancers reveal simultaneously and singularly an energetic landscape, a charged terrain of options. Their actions are manifestations of surging phenomena, imperceptible but always active. Violet is a steep descent into a maelstrom, a swirl of energetic patterns and kinetic sculptures full of detail, partnered live on stage by musician Brendan Dougherty on electronics and percussion. In VIOLET, Meg Stuart turns to movement as its primary motor, pairing choreography with an alchemy of the senses. Perhaps the most abstract piece so far in her long standing career, VIOLET bears Stuart’s unique signature, an art that hones a frail ‘condition humaine’ in its intense physical emergence. Five dancers in an abstract maelstrom that sweeps you away. Somebody was waving, as I was leaving the theatre. Waving goodbye to someone else. As I saw that stretched arm, up in the air, in the distance, I realized she had gotten to me. Once again. From now on every waving arm will probably make me think about Violet. 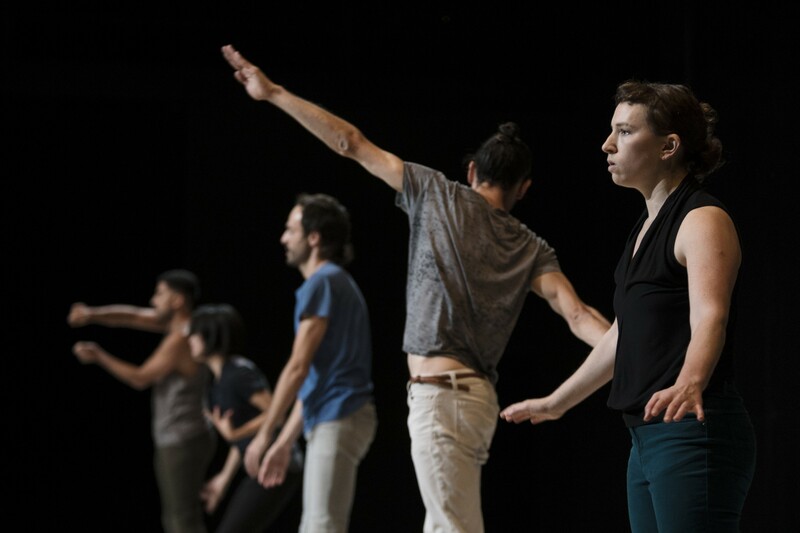 For the first time in many years American choreographer Meg Stuart skips all narrative elements and crossbreedings: just five dancers and one musician on stage. For a trip you might or might not like, but one you’re not likely to forget. 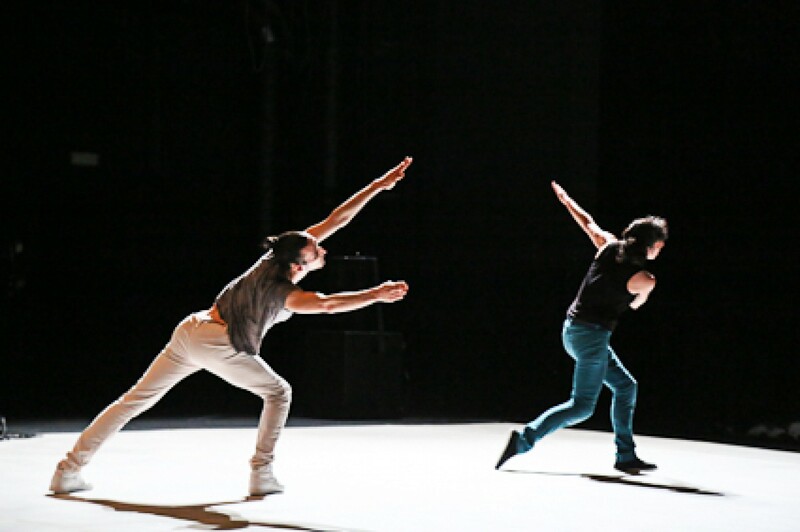 Violet premiered in Essen, earlier this month, and had its French premiere at the Festival d’Avignon. A flash of light and there they are. Five dancers, standing just in front of a slightly curved black wall, facing the audience. At the left side of the empty stage: Brendan Dougherty, behind a laptop and a drum kit. Very slowly he rises the volume of his soundscape. And still those dancers aren’t moving. Or wait: did I just see one hand move a little bit? No. Yes. Yes I did. It looks as if these bodies are defrosting. An arm is raised. A head moves. A torso is turning slightly. But still those feet stay firmly rooted. Those legs aren’t moving. The movements become more intense. I think by myself: I’ve never known that the upper part of the body can do that many things, without having to involve the lower part. By then the volume has become really loud. And this spaceship called Violet is taking off. I’m not a big fan of unnecessary decibels, as you might know by now, but this time around, I understand that a certain volume level is needed to make this trip a succesful one. And luckily enough, it never becomes really unbearable. It’s one long piece of electronic music necessary to create this feeling of a maelstrom. To create this feeling of a world outside the world as we know it. This strange universe where people aren’t moving as they should be moving, even though their movements are oh so familiar. Bodies are bending, necks are twisting, shoulders are rotating, arms are waving, mouths are screaming. And those legs start moving to. Step by step those five dancers are moving forward. They use the rest of the space. But don’t expect them to run or to move those legs high up in the air. No: it’s as if they need to stay grounded, as in the aftermath of some nuclear disaster. Shell-shocked. This has nothing to do with moving gracefully or elegantly. But on the other hand: don’t think they’re just freaking out or improvising. You just feel that a lot of attention has been paid to all the different details. This is a tightly choreographed piece.Don’t expect them to build a ‘classic’ group choreography either, to dance in unison. It appears as if these five people aren’t even aware of each other’s existence, but observe closely and you’ll see that certain elements are passed on. When they finally do come together, they form a beautiful ball of energy, rolling on a floor that has become an impressive rainbow. I could tell you more, about what goes on in Violet, but let me stop here. Allow me just to predict that you too, you’ll be standing outside, after the performance, wondering what kind of trip you’ve just been on. Violet is probably the most abstract piece Meg Stuart has made in a long time. No acting, no video, no narrative elements. It means that this is a choreography that is moving forward, so to speak, along only one wavelength. (Don’t get me wrong. By that I don’t mean that it’s poor or too simple). Personally, I’m more fond of a more multi-faceted approach, as in Meg Stuart’s extraordinary Do Animals Cry or that melancholic Maybe Forever. But some will certainly fall for the radicalism of this impressive return to the world of pure movement.